12 month percutaneous tibial nerve stimulation treatment interval results: outcomes from the OrBIT Trial. MacDiarmid, S., et al. (2010). Poster, International Continence Society, Toronto, Canada. HYPOTHESIS / AIMS OF STUDY: The 12 week Overactive Bladder Innovative Therapy (OrBIT) Trial was a randomized, multi-center, controlled study that demonstrated comparable effectiveness of percutaneous tibial nerve stimulation (PTNS) to extended-release tolterodine . The OrBIT 12 month study demonstrated the long term effectiveness of PTNS for the treatment of overactive bladder (OAB) with results showing that symptom improvements after 12-weekly PTNS treatments were sustained throughout 12 months of therapy . The objective of this study was to evaluate the treatment interval frequency necessary to maintain efficacy. STUDY DESIGN, MATERIALS AND METHODS: After 12 weeks PTNS treatment, responders were treated for an additional 9 months of therapy at tapered intervals. Frequency of PTNS was determined by subject OAB symptom control and symptom deterioration. Voiding diaries and Overactive Bladder Questionnaires (OAB-q) were completed at baseline, 12 weeks, and 6 and 12 months. Outcome measures included voiding frequency, urinary urge incontinence episodes, urgency episodes, and voids causing waking, volume per void, and quality of life indices. Subjects completed Global Response Assessments (GRA) at 12 weeks, 6 and 12 months. RESULTS: 35 subjects continued PTNS therapy after an initial 12 weekly treatments. Thirty-two and 25 subjects completed voiding diaries at 6 and 12 months, respectively. All objective improvements in voiding diary variables demonstrated at 12 weeks were sustained at 6 and 12 months. Subject GRA similarly demonstrated sustained improvements with 94% reporting sustained GRA improvement from 12 weeks. The mean number of days between treatments was 21 days from 12 week visit through 12 month visit, see Figure 1. 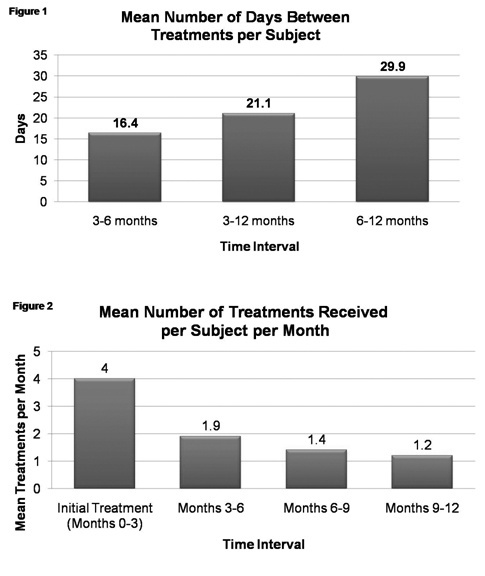 Mean number of treatments received per month over 12 months, including initial weekly treatment for 12 weeks, ranged from 1.2 to 4, see Figure 2. INTERPRETATION OF RESULTS: PTNS demonstrated sustained therapeutic efficacy over 12 months following initial success at 12 weeks. Subjects received as low as 1.2 treatments monthly to sustain symptom improvement throughout 12 months. CONCLUDING MESSAGE: The response to PTNS therapy achieved following 12 weeks of treatment demonstrates excellent durability through 12 months of follow-up with 94% sustained improvement from 12 weeks. Analysis of number of treatments needed to sustain therapeutic effect appears acceptable. Peters KM, MacDiarmid SA, Wooldridge LS, et al: Randomized trial of percutaneous tibial nerve stimulation versus extended-release tolterodine: results from the overactive bladder innovative therapy trial. J Urol 2009; 183: 1055. MacDiarmid SA, Peters KM, Shobeiri SA, Wooldridge LS, Rovner ES, at al: Long-Term Durability of Percutaneous Tibial Nerve Stimulation for the Treatment of Overactive Bladder. J Urol 2009; 183: 234.